I keep these at work rather than carrying them back-and-forth every day so I don’t forget them at home and have to use plastic. I have never used the chopsticks, but I use the fork and spoon daily. The knife works surprisingly well even though it doesn’t seem that sharp. I received these as part of my Mighty Fix subscription. I keep them in my purse all the time so that I never have to use plastic utensils. If I end up eating lunch at a place that has plastic utensils I just tell them I don't need any. My son has used the spoon for eating frozen lemonade at a festival. I use the chopsticks when a restaurant gives me disposable ones. I am extremely happy with this product. I've had it several months now and experienced no problems with it at all. I received these as my monthly Mighty Fix and now i give them away as gifts to friends and loved ones all the time! I don't get plastic ware from restaurants any longer and I take these with me in trips and for every day! 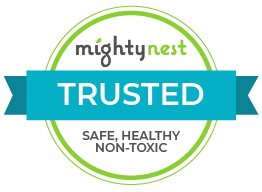 Thank you Mighty Nest for the introduction! I'm such a fan of this product and of the items you send me each month! It's a fun surprise! I love my bamboo utensils. They're light to carry and I love the cute little case. I like saving on plastic waste, but most of all, I just like using the utensils. They are so much nicer to use than disposable plastic. I will be ordering more for gifts! I love these utensils! I have used mine all school year and they are still like new--I just wash off and keep them in my desk in the handy storage bag. Unfortunately my spoon has gone missing. Is there a way to buy just the one piece to replace it? Great set with handy carrying case! I use it for lunches at work, but it's fantastic for taking along when I get take-out - clip it onto my water bottle or stash it in my purse so I don't have to use plastic silverware. The utensils themselves are high quality and don't impart any weird flavors when using with hot foods. what a great product!! they travel well, are good for the office too, and are ideal to use with stainless steel contenats, where you cannot use stainless steel utensils. great quality and I love that they come with chopsticks too. I love my bamboo utensils! I really wanted something durable, easy to clean, and leave a smaller footprint on the planet. And I these utensils have helped me accomplis my goal! Love the bamboo utensils! So lightweight and she always has her fork, spoon, and knife if needed. Doesn't take up much room either. Easy to clean! Fantastic! Well-made, and a practical solution to reducing our plastic footprint! My son also loves that this set comes with chopsticks. These are extremely practical to have. I can just throw this in my bag and I have utensils whenever needed that are not wasteful like the plastic wear you find everywhere. So far so good. Well worth the money, impressive that they go in the dishwasher! Very nice but the knife is clearly designed for right-handed people. Received these recently as part of my mighty nest subscription. I love the feel of the bamboo, the pouch with a little hook to attach to a bag or purse, and the fact that there are chopsticks included. Unfortunately, after about 7 uses, the tip of the spoon cracked off leaving a rough edge to the spoon. I wasn't abusing them or trying to break up hard food. I had not washed them in a dishwasher or left them soaking in liquid. So I'm not sure how it even happened. I'm disappointed because I love the look, feel and idea of them. I had placed 3 more sets in my cart for my next shipment, but I've now removed those sets from my order. I was very excited to get this and use it in my lunch bag... sadly, the chopsticks were not compressed/fused together correctly and small chunks of bamboo were splintering off right out of the box. Also the fork has such wide tines that you cant stab a tomato or any vegetables with success. The spoon and knife are good... it is just disappointing to have high expectations and them to fall so short. I received this as my Mighty Fix this month and I am very disappointed. This product is not very useful to me and the design is not very good either. The spoon is too large for my mouth and to flat to scoop anything liquid, the fork is ginormous and blunt. The knife is curved, like a spoon. How can you spread anything with that? I use my silverware for lunches and whatnot. Do not need more clutter. To me, this was a complete waste of $10. I agree with other reviewers who were disappointed to receive this item in their mighty fix. I will never use this item as I have no idea what problem it solves. My metal utensils are easy to transport wrapped in a cloth napkin, and they are much more functional. It tempted me to cancel my mighty fix as soon as I opened the box. You'll notice there are a number of high scores for this product, and then a few of us one starring it. What's the difference? People who had this very specific want/need, and those of us who received this as our monthly Mighty Fix. This is not a product most people need or want. It's bulky, and I do not find myself eating places that don't have silverware. Even if I did, I wouldn't want to deal with these, as the overall package is bulky. My handbags aren't big enough for these! And what the heck with that fork... it's... like a child drew it. I don't even know what you would eat with that spoon - it's shaped like an old school wood spoon. I mean, it is a wood spoon. And the knife. I guess you could spread mayo with it. I do appreciate the look of the carrying case and that it includes chopsticks. But I had no need for this, and I think the segment of your subscribers/shoppers who do is small. I'm with the other poster -- one more weird fix and I'm out. Please take this back. I didn't complain about the skin balm (thanks for assuming I have cracked skin and diaper rash??) but I'm about ready to stop throwing $10 at ya monthly for random crap that I don't need. This was a very stupid monthly fix. I take my own regular utensils to work and bring them home. Why would I need bamboo ones and in a case? What a waste that is! How does that help? People who use disposable utensils do it so they can throw them away. Bamboo vs stainless ... you still have to wash them. One more crappy fix and I'm cancelling. I received a dryer wool ball set that I specifically asked NOT to receive when I joined. I received beeswax wrap that will tightly seal NO glass bowl ever, and when I was supposed to receive reusable snack bags, I got beeswax wrap again and had to email and call to have the right item sent. Now this useless item. I like many of your products and have made purchases with my fix that I could have bought cheaper elsewhere, but one more unusable waste of my $10 and I'm out!!! To-Go Ware's mission is to make available innovative products that provide a solution, tell a great story, and are enjoyable to use. To-Go Ware seeks to stimulate positive practices for the way people live in relationship with themselves, their neighbors and the planet. They hope to empower people to participate in the process of changing the world they live in by providing them the tools to do so. To-Go Ware offers solutions for a world with life on-the-go. Life is moving fast for everyone these days, and sometimes that can cause us difficulty in making conscious lifestyle choices-especially when it comes to food! With the explosion of "to-go" culture, there is no shortage of disposable containers and utensils crossing our paths everywhere we go, and we've all started to feed the landfill more than we may realize. How many plastic forks and spoons do we toss away each week? How many plates, to-go boxes, napkins and cups? Start to do the math and see what that adds up to per year-you may be surprised at the impact you are having. If they cannot abandon our need for "to-go" convenience as we move through our busy lives, they can certainly integrate ways of being more mindful and conscious of the impact our lifestyle has upon the planet...their hope is that To-Go Ware can provide you the tools to make that difference, allowing you to be a Solutionary in these to-go times.